Today as per the count should be a Sell day, would you consider longs on these days, and how would price action today fit into that. Often Sell days can be confusing. Today so far is no exception as we have reached the TTT projection numbers and have declined since, however the decline is weak so far and TVGR is in effect. 2/5 was a SS day. 2/4 we had a good sell off and the momentum continued today. The markets gapped down tried to rally just to reverse and go test the Buy day lows. We normally should not long on SS day, with just a few exceptions. This trade is one that often works. We opened at 822.5 and only rallied to 825.50. The Buy day low was at 816 on 24 hour session and 818 on Day session. So at this point it did give us a Positive 3 Day Rally, however it was well below the average of 38 points. We have a cluster of 3 fibs at 817 to 818 area and the MTP DP. The Buy day low at 816-818. Again we had strong support in that area. 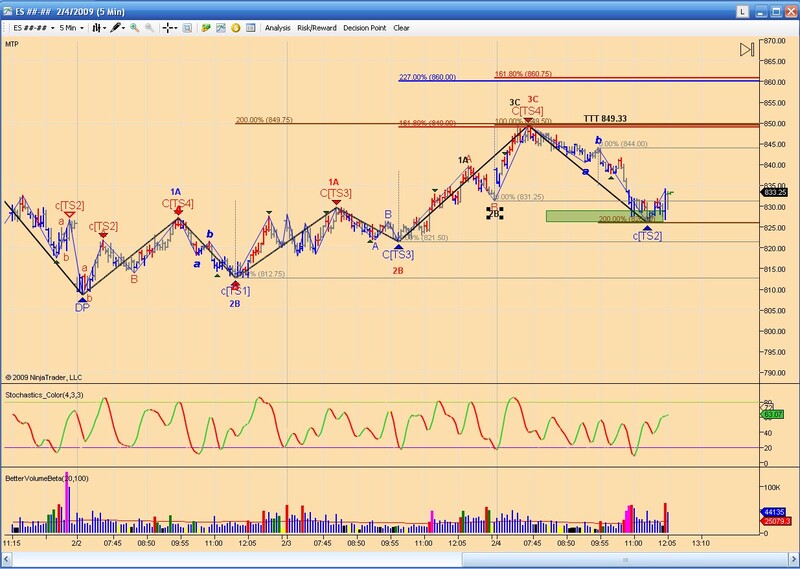 A long could have been taken at 818.25 area with a stop just below the day low of 816.75. A low risk trade. The market rallied and never looked back until we got close to the previous day high. We also know from the report that the average spread/range for today is 33.32 points. Therefore an exit at 25 to 30 point profit would have been more than acceptable. Does the MTP DP appear right on the close of a bar or sometime after ? Thanks. Today was a Buy day. The concerns of last night ended up materializing and only a small Decline took place. TVGR took effect and the markets rallied all day. I don't like picking tops on TVGR days but we had numerous fibs at 868.50-869 and if we add the average range of 33 points expected for today, 869 ended up being the top for today. Today was a Sell day. We did make new highs at the projected average rally on either the recap or recap MA page for all indexes. The markets then did the usual confusing day pattern of up and down.